I have this laptop a few months now and it's steadily gotten worse and worse performance wise. I am getting regular crashes now also since the recent BIOS and Graphics driver upgrades. I have seen others saying to roll back drivers to stop crashes but I'm hoping for a driver update to sort the crashing. I'm wondering if I have bigger issues than driver ones, perhaps hardware problems as this thing is running so badly. I firstly noticed big issues running DaVinci Resolve 12.5 where is basically couldn't play a Mavic Pro mp4 where my 2014 MacBook Pro managed it with ease in DaVinci just fine. Has anyone here done benchmarks since the recent driver & BIOS updates and what are you getting? This might help me work out if I have a hardware issue. > I am getting regular crashes now also since the recent BIOS and Graphics driver upgrades. I have seen others saying to roll back drivers to stop crashes but I'm hoping for a driver update to sort the crashing. Please Dell withdraw this driver instantly, because it is being pushed to users via Windows Update, and many don't know how to stop it from loading back after a downgrade ("wushowhide" should work though)! It is also highly probable that you have another performance issue, like a cooling problem due to heatsink fins clogged with dust or due to poor mounting of the heatsink (requires repasting). Substandard SSD performance is also common, is often improved a lot by turning off RAID (to AHCI) and using a NVMe driver from the SSD manufacturer. But firstly you need to fix driver bugs causing system instability, otherwise you can't tell what is okay and what is not. Thanks for the reply but I already have the latest BIOS installed so I don't think this is the issue. I've a feeling it might be hardware if nobody else is seeing this. 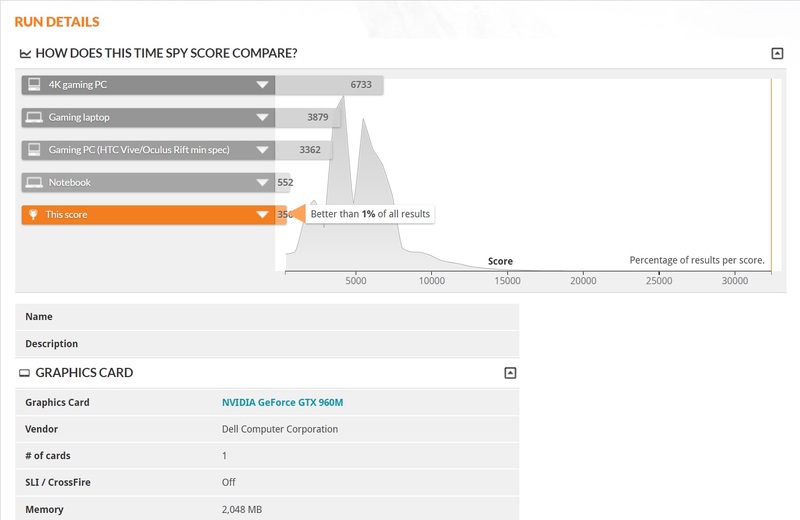 Those 3DMark scores are shocking bad. If anyone else can run some on the latest BIOS and drivers (except Intel 530 as latest crashes the laptop running the test) and post their scores that would be really helpful. Sorry for the delay but I'm only seeing your reply now. It's definitely not dust or dirt as the laptop has barely been used and when it has it's been on pretty much dust free surfaces. I will try the driver and BIOS rollbacks you've suggested but I'm not sure if that could have it performing so badly.. I will report back with any progress/findings. I'm still no further on with my XPS 15 performance issues. I tried everything suggested and even got onto Tech Support today also who suggested lots of different suggestions that none of them helped though I'm afraid.. They suggested all the same things already suggested here but there is a new Intel 530 driver that I wasn't aware of, might help others. I no longer get the BSOD crashes but my performance still *** using this driver. I haven't heard anything back from them since around 4:50 so perhaps they've finished up for the day. Hopefully they've a few more suggestions to try tomorrow. My 3DMark scores are getting lower and lower so either each driver release is making things worse or the laptop is slowly dying..